HIT is divided into 2 types, depending on whether immunologically mediated or not. Few of the main risk factors for the development of HIT are high dose of intravenous UFH, UFH, bovine heparin, and patients undergoing surgery. HIT is manifested by thrombocytopenia between 5 and 15 days of heparin treatment. Clinical scoring  to diagnose HIT is composed of 4 "T"s: (1) Thrombocytopenia; (2) Timing; (3) Thrombosis; and (4) The absence of other explanations. The scoring system is derived from the 4 "T"s [Table 1]. HIT has to be differentiated from disseminated intravascular coagulation (DIC), heparin toxicity, and hyperresponsive thrombocytopenia. It is critical to differentiate these conditions from HIT as their management is totally different from that of HIT. Mainly the following complications are seen in HIT patients: venous/arterial thrombosis, skin lesions, and acute platelet activation syndrome. Alterative anticoagulants are required in HIT patients with thromboembolic phenomenon or routine essential procedures (hemodialysis) or emergencies, such as acute coronary syndrome. The alternative anticoagulant agents to heparin are direct thrombin inhibitors (which directly inhibit thrombin generation) danaparoid, Fondaparinux (selective factor X inhibitors), and warfarin (vitamin K antagonist). Details of the pharmacodynamics and pharmacokinetics of these agents are discussed in the Treatment section. As the highest risk for development of thrombosis is from the time of diagnosis of HIT to the starting of antithrombin agents, the management of HIT patient should be started without delay and waiting for the results of confirmatory laboratory tests. The treatment of HIT is summarized by 6 "A"s  : (1) Avoid and stop all heparin (any form, any route, heparin flush, or heparinized catheters). (2) Also start direct thrombin inhibitors. (3) Anti-PF4/heparin antibody test for confirmation of diagnosis. (4) Avoid platelet transfusion. (5) Await platelet recovery. (6) Assess lower extremity thrombosis. In the management of HIT patients it is of vital importance to know what not to do [Table 2]. The Direct Thrombin Inhibitors (DTI) are the medication of choice in patients with HIT or interventions where heparin is indicated but cannot be used, as these agents neither interact with heparin-dependent antibodies nor do they need an antithrombin as a cofactor [Figure 2]. DTI have a predictable anticoagulant effect. They rapidly stop the thrombin storm and some of them prevent new thrombus formation. The available DTI are argatroban, lepirudin, desirudin, bivalirudin, melagatran, and ximelagatran. Depending on their structural configuration, DTI are divided into 2 groups. The lepirudin and smaller synthetic analogs (desirudin and bivalirudin) are divalent DTI, as they interact with both catalytic and substrate recognition site on thrombin. The monovalent DTI include argatroban, melagatran, and ximelagatran; these agents interact with the catalytic site of thrombin only. Group 1 DTI or divalent DTI; lepirudin and desirudin are 65-amino acid, polypeptides, the amino terminal binds to the catalytic site whereas carboxyl terminal irreversibly binds to the exosite of thrombin. Bivalirudin is a 20-amino acid derivative of hirudin, the peptide bond slowly cleaved from the catalytic site on thrombin; hence it is a reversible inhibitor of thrombin with shorter half-life. Lepirudin and desirudin are given by intravenous and subcutaneous route, and half-life is 60 and 120 min, respectively. Both are excreted predominantly through the renal system; and therefore, need dose adjustment in patients with renal insufficiency. The initial loading dose is 0.4 mg/kg, then 0.15 mg/kg/h. Bivalirudin is given intravenously, largely cleared by peptidase but 20% is excreted through the kidneys, and needs dose adjustment in patients with renal impairment  [Table 3]. A few more medications, such as danaparoid sodium and Fondaparinux, are also used in HIT patients for the treatment and prevention of thrombosis. A few routine but essential procedures performed by using heparin are hemodialysis, Percutaneous Coronary Intervention (PCI), and Cardiopulmonary Bypass (CPB); but cannot be used if the patient develops HIT. HIT patients with unstable angina, thromboembolism, indwelling devices, such as valve replacement or intraaortic balloon pump, will require alternative anticoagulation therapy. Hypercoagulability in HIT patients in combination with endovascular disruptions PCI and CPB will particularly increase the risk of thrombosis. Argatroban, bivalirudin, and danaparoid are commonly used in PCI and the dosages are as follows: an initial bolus dose of bivalirudin should be 0.75 mg/kg, followed by 1.75 mg/kg/min; argatroban bolus of 350 mcg/kg followed by 25 mcg/kg/min infusion with ACT monitoring; and danaparoid 2200 unit bolus followed by 150-200 units/h with anti-Xa levels monitoring. If possible CPB surgeries should be postponed till PF4-heparin antibodies negative. If surgery has to be done, bivalirudin, lepirudin, argatroban, or danaparoid can be used. In patients with multiple organ dysfunction/failure who are critically ill and may have hepatic/renal impairment or failures, the dose of DTI should be adjusted with meticulous monitoring of the coagulation parameters, but drug accumulation and lack of antidote will put these critical patients at the risk of potential side effects. Bivalirudin demonstrated better safety as it is cleared predominantly by the enzymatic cleavage. Keeping heparin therapy for shorter duration and starting warfarin early if expecting prolonged anticoagulation. Stopping the use of heparin flush for central and arterial catheters. Heparin-free dialysis and not using heparin lock. Heparin is the commonly used anticoagulant; about 30% of hospitalized patients are exposed to some form of heparin. Most feared complication of heparin use is HIT. HIT is a clinicopathologic, procoagulant condition with thrombocytopenia in patients on heparin therapy, with decrease in platelet count by 50% or to less than 100 × 103/L, from 5 to 14 days of the therapy. It is diagnosed by 4 "T"s thrombocytopenia, timing, thrombosis absence of other causes for thrombocytopenia, and the diagnosis is confirmed by immunoassay. HIT is common in surgical and orthopedic patients. The risk of HIT is more with high dose of intravenous heparin and bovine heparin. Deep venous thrombosis and pulmonary artery embolism are common in HIT patients. Management of HIT is to stop heparin, and DTI are backbone of HIT therapy. Few cases of successful pulmonary embolectomy and arterial thrombolysis in HIT patients with massive pulmonary and arterial thrombosis are reported. Mortality in HIT patients can be as high as 30%, but it can be significantly reduced with the use of DTI to 16%. A few routine but essential procedures performed by using heparin are hemodialysis, PCI, and CPB; but cannot be used if the patient develops HIT. HIT patients with unstable angina, thromboembolism, indwelling devices, such as valve replacement or intraaortic balloon pump, will require alternative anticoagulation therapy. HIT can be prevented significantly by keeping heparin therapy shorter, avoiding bovine heparin, using LMWH, and by stopping the use of heparin flush and heparin lock. 1. Levy JH, Hursting MJ. Heparin induced thrombocytopenia: A prothrombotic disease. Hematol Oncol Clin North Am 2007;21:65-88. 2. Stéphan F, Hollande J, Richard O, Cheffi A, Maier-Redelsperger M, Flahault A. Thrombocytopenia in a surgical ICU. Chest 1999;115:1363-70. 3. Warkentin TE, Chang BH, Greinacher A. Heparin induced thrombocytopenia: Towards consensus. Thromb Haemost 1998;79:1-7. 4. Warkentin TE, Roberts RS, Hirsh J, Kelton JG. An improved definition of immune heparin-induced thrombocytopenia in postoperative orthopedic patients. Arch Intern Med 2003;163:2518-24. 5. Warkentin TE, Levine MN, Hirsh J, Horsewood P, Roberts RS, Gent M, et al. HIT in patients treated with lower molecular weight heparin or fractional heparin. N Eng J Med 1995;332:1330-5. 6. Warkentin TE, Sheppard JI, Horsewood P, Simpson PJ, Moore JC, Kelton JG. Impact of patient population on risk of heparin-induced thrombocytopenia. Blood 2000;96:1703-8. 7. Girolami B, Prandoni P, Stefani PM, Tanduo C, Sabbion P, Eichler P, et al. The incidence of HIT in hospitalized medical patients treated with subcutaneous heparin. Blood 2003;101:2955-9. 8. Greinacher A. Heparin associated thrombocytopenia. Biomed Prog 1994;7:53-6. 9. Rhodes GR, Dixon RH, Silver D. Heparin induced thrombocytopenia: Eight cases with thrombotic and hemorrhagic complications. Ann Surg 1977;186:752-8. 10. Nisio MD, Middeldrop S, Buller HR. 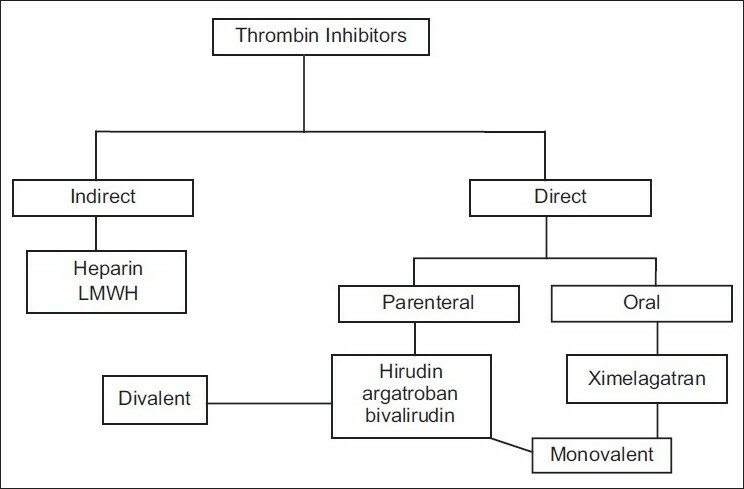 Direct thrombin inhibitors. N Eng J Med 2005;335:1028-40. 11. Amiral J, Bridey F, Dreyfus M, Vissoc AM, Fressinaud E, Wolf M, et al. Platelet factor 4 complex to heparin is target for antibodies generated in heparin-induced thrombocytopenia. Thromb Haemost 1992;68:95-6. 12. Fabris F, Ahmad S, Cella G, Jeske WP, Walenga JM, Fareed J. Patho-physiology of heparin induced thrombocytopenia, clinical and diagnostic implications; a review. Arch Pathol lab Med 2000;124:1657-66. 13. Kelton JG, Warkentin TE. Heparin-induced thrombocytopenia. Diagnosis, natural history, and treatment options. Postgrad Med 1998;103:169-71. 14. Arepally G, Reynolds C, Tomaski A, Amiral J, Jawad A, Poncz M, et al. Comparison of PF4/heparin ELISA assay with serotonin release assay in diagnosis of heparin induced thrombocytopenia. Am J Clin Pathol 1995;104:648-54. 15. Levi M. The coagulant response in sepsis. Clin Chest Med 2008;29:627-42. 16. Zidane M, Schram MT, Planken FW, Molendijk WH, Rosendaal FR, van der Meer FJ, et al. Frequency of major hemorrhage in patients treated with unfractionated intravenous heparin for deep venous thrombosis or pulmonary embolism: A study in routine clinical practice. Arch Int Med 2000;160:2369-73. 17. Pichford SC, Momi S, Banglioni S, Casali L, Gianni S, Rossi R, et al. Allergen induces the migration of platelets to the lung tissue in allergic asthma. Am J Respir Crit Care Med 2008;177:604-12. 18. Warkentin TE, Kelton JG. A 14-year study of Heparin-induced Thrombocytopenia. Am J Med 1996;101:502-7. 19. Bauer KA. New anticoagulants: Anti-IIa vs. anti-Xa is better? J Thromb Thrombolysis 2006;21:67-72. 20. Warkentin TE. Heparin induced thrombocytopenia; diagnosis and management. Circulation 2004;110:454-8. 21. Srinivasan AF, Rice L, Bartholomew JR, La Perna L, Thompson JE, Murphy S, et al. warfarin induced skin necrosis and venous gangrene in setting of heparin induced thrombocytopenia. Arch Intern Med 2004;164:66-70. 22. Selling K, Warkentin TE, Greinacher A. Heparin induced thrombocytopenia in intensive care patients. Crit Care Med 2007;35:1165-76. 23. Kam PC, Kaur N, Thong CL. Direct thrombin inhibitors pharmacology and clinical relevance. Anaesthesia 2005;60:565-74. 24. Greinacher A, Eichler P, Lubenow N, Kwasny H, Luz M. HIT with thromboembolic complications; Metaanalysis of 2 prospective trails to assess the value of parental treatment with lepirudin and its therapeutic aPTT rang. Blood 2000;96:846-51. 25. Bartholomew JR. Transition of oral anticoagulant in patients with HIT. Chest 2005;127:27S-34. 26. Greinacher A, Janssens U, Berg G, Böck M, Kwasny H, Kemkes-Matthes B, et al. Lepirudin (Recombinant Hirudin) for Parenteral Anticoagulation in Patients with Heparin-Induced Thrombocytopenia. Heparin-Associated Thrombocytopenia Study (HAT) investigators. Circulation 1999;100:587-93. 27. Lewis BE, Wallis DE, Berkowitz SD, Matthai WH, Fareed J, Walenga JM, et al. Argatroban Anticoagulant Therapy in Patients with Heparin-Induced Thrombocytopenia. Circulation 2001;103:1838-43. 28. Badger NO, Butler k, Hallman LC. Excessive anticoagulation and anaphylactic reaction after rechallenge with lepirudin in a patient with HIT. Pharmacotherapy 2004;24:1800-3. 29. Ibbotson T, Perry CM. 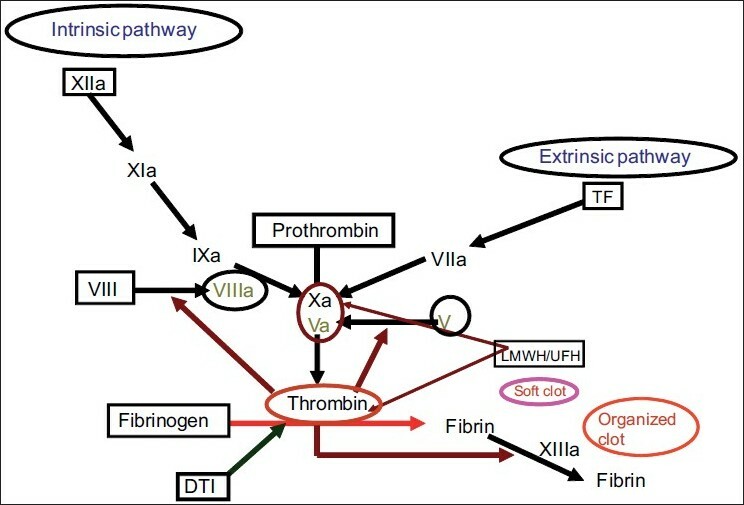 Danaparoid: A review of its use in thromboembolic and coagulation disorders. Drugs 2002;62:2283-314. 30. Ahmad S, Jeske WP, Walenga JM, Hoppensteadt DA, Wood JJ, Herbert JM, et al. Synthetic pentasaccharides do not cause platelet activation by antiheparin - platelet factor4 antibodies. Clin Appl Thromb Hemost 1999;5:259-66. 31. Nakamoto H, Shimada Y, Kanno T, Wanaka K, Matsuo T, Suzuki H. Role of platelet factor 4- heparin complex antibodies in pathogenesis of thromboembolic episodes in patients on hemodialysis. Hemodial Int 2005;9:S2-7. 32. Warkentin TE, Maurer RH, Aster RH. Treatment and prevention of heparin induced thrombocytopenia: American college of chest physician evidence based clinical practice guidelines. Chest 2008;133:S340-80. 33. Lewis BE, Walenga JM. Argatroban in HIT type II and acute coronary syndrome. Pathophysiol Haemost Thromb 2002;32:46-55. 34. Huhle G, Hoffmann U, Hoffmann I, Liebe V, Harenberg JF, Heene DL. A new therapeutic option by subcutaneous recombinant hirudin in patients with heparin-induced thrombocytopenia type II: A pilot study. Thromb Res 2000;99:325-34. 35. Jang IK, Hursping MJ. When heparin promotes thrombosis: Review of heparin induced thrombocytopenia. Circulation 2005;111:2671-83. 36. Parvin kumar E, Webster NR. HIT/HITT and alternative anticoagulation: Current concept. BJA 2003;90:676-85. 37. Demers C, Ginsberg JS, Brill-Edwards P, Panju A, Warkentin TE, Anderson DR, et al. Rapid anticoagulation using ancord for heparin induced thrombocytopenia. Blood 1991;78:2194-7. 38. Calligaro KD, Kansagra A, Dougherty MJ, Savarese RP, DeLaurentis DA. Thrombolysis to treat arterial thrombotic complication of heparin induced thrombocytopenia. Ann Vasc Surg 1995;9:397-400. 39. Ralph-Edwards AC, Feindel CM, Glynn MF. Successful treatment of massive pulmonary embolism after coronary bypass due to heparin induced thrombocytopenia. Ann thorac Surg 1994;57:1326-8. 40. Francis JL, Palmer GP, Morose R, Drexler A. Comparison of bovine and porcine heparin in heparin antibody formation after cardiac surgery. Ann Thorac Surg 2003;75:17-22. 41. McGill RL, Blas A, Bialkin S, Sandroni SE, Marcus RJ. Clinical consequences of heparin free dialysis. Hemodial Int 2005;9:393-8. Ahmed, S. and Ahmad, S. and Kashif, M.
ZieliÅ„ski, G. and Witek, P. and Koziarski, A. and PodgÃ³rski, J.